Yep, it’s a traffic cone. Located on one side of the Royal Exchange Square in Glasgow, the statue stood quietly with honor for most of 140 years. Then, one fateful night in the early 80s, the Duke’s new helmet appeared. The back story is unknown. Most folks figure it was a university student, likely fortified with liquid courage, doing it on a dare. 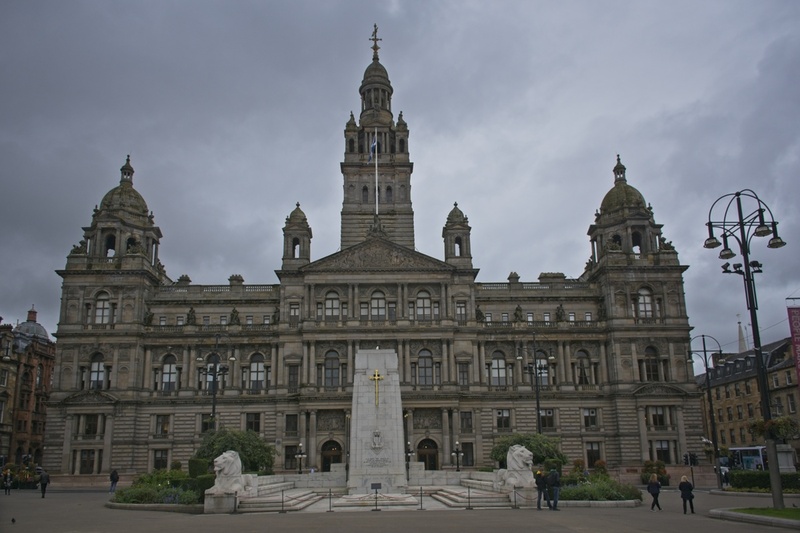 The Glasgow city council, appalled by the lack of decorum, had the traffic cone removed. This solved the problem for a few days but the die was cast. Inspired by the pointed precedent, a mysterious haberdasher struck again, and once again the Duke found himself directing traffic. And so it went. The council had the cone removed. The Coneheads struck back. Back and forth, each group asserting itself time after time, year after year. Finally, in 2013, the council had had enough. They proposed rebuilding the pedestal, doubling its height to 6 feet, to make it more difficult to give Wellington a hot orange Scottish bonnet. This did not go over well. Within 24 hours, a ‘Keep the Cone’ Facebook page had accumulated over 72,000 fans who united in opposition to the council’s plans. 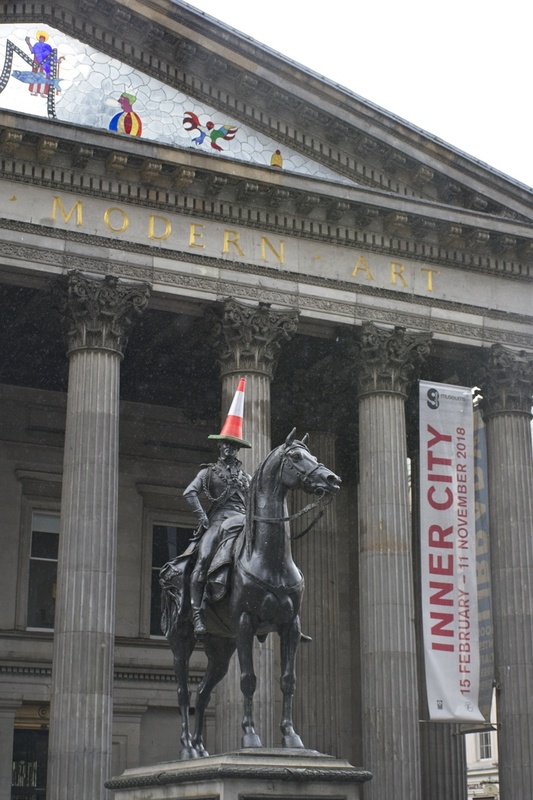 By this time, the gag was so well established the locals felt Wellington’s odd hat was not vandalism, but rather a tongue-in-cheek representation of Glasgow’s culture. They’d rather have a laugh than spend a pile of Scottish pounds on something only the council wanted. It didn’t hurt that the Duke had become a bigger tourist attraction wearing his orange headpiece than he ever was as yet another statue honoring yet another historical figure. It seemed the tourists would rather have a laugh too. The council recanted, and Wellington officially gained his status as not only an honored leader of the British army, but as the leader of the Coneheads. The observant among you have noted I’ve been absent for six weeks or so. 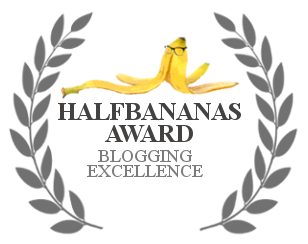 This was not because of anything awful or life-changing, I just needed a break from blogging. Hopefully, there are still a few followers out there who will pick up the thread where we left off. And maybe, if I’m lucky, even a few new ones, willing to start the new year with a new adventure. Ah yes. We’d just finished our tour of Ireland, ending in Belfast, and heading off to the ferry to take us to Scotland. Our first stop was to be Glasgow, but en route we passed this forlorn ruin, another monument to an earlier day, also reduced in grandeur. As for Glasgow proper, we didn’t do that much. We wandered across the Royal Exchange Square, a town square taking a full city block, replete with statues and brick. Across the square from Wellington and his well-trafficked headgear was the city council chambers, an impressive building both inside and out. No wonder they got their knickers in a snit when someone was less than respectful to a British nabob. Could they be next? 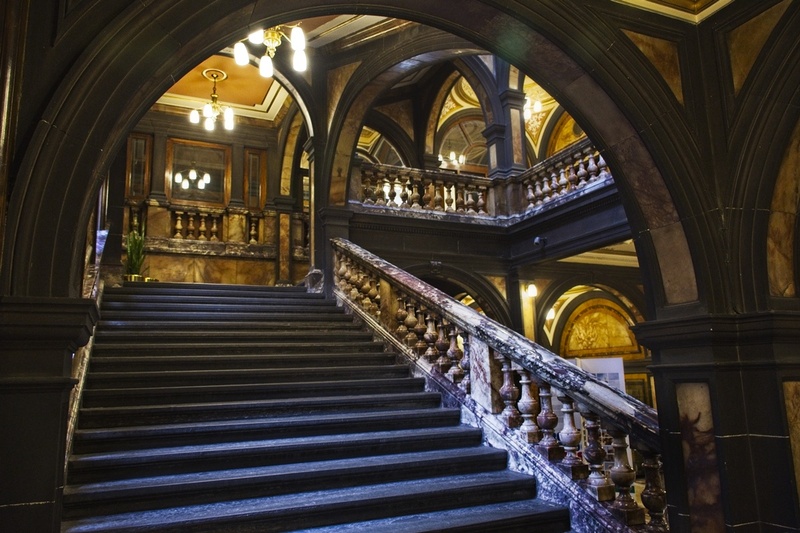 Glasgow City Chambers, with a war memorial in front. I mentioned the edifice behind Wellington was a monument to the arts. Specifically, a Museum of Modern Art, making Wellington’s new look all the more apt. 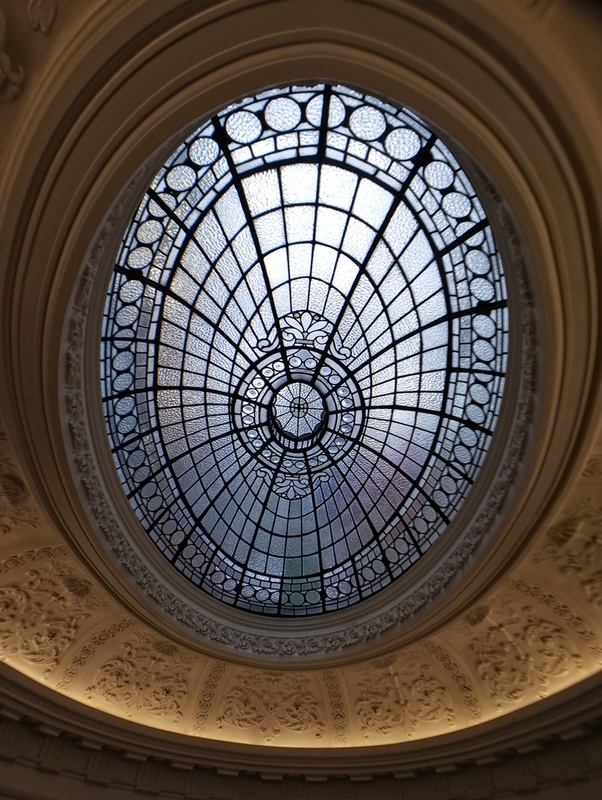 As we had time to kill, and museums in Scotland and Ireland tend to be free (donations gladly accepted, nudge nudge wink wink), we entered the museum for a look-see. I freely admit I’m not a great fan of modern art. Abstractionism often leaves me scratching my head. (And I’ll thank you to forget I said that, someday when I post abstract macro photos.) Other things seem like the “artist” just gathered up stuff they had lying around, threw it in a heap, and called it a masterpiece of personal expression. Strangely enough, patrons, perhaps reminiscent of their own bedrooms, flock in to agree. 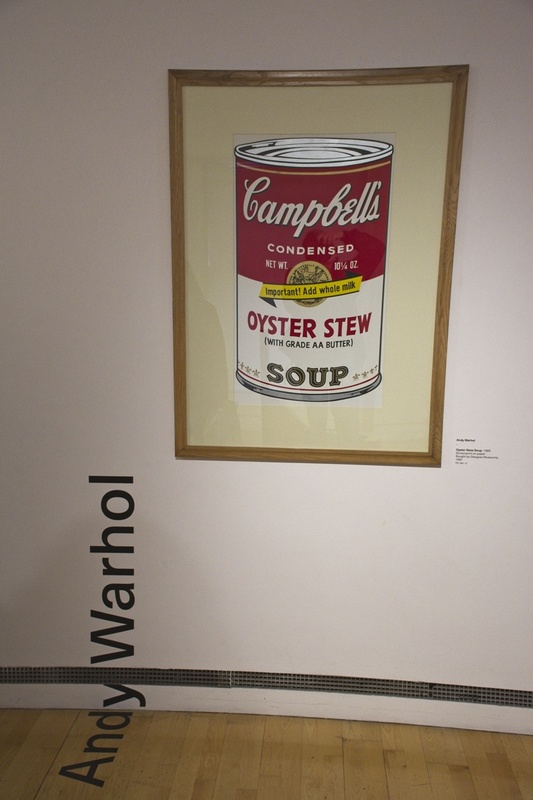 Despite my indifference, I got to see one of Warhal’s collection of Campbell’s Soup can paintings, so I can now say I’m hip with the scene. The layout was interesting. It had a central open oval atrium running all the way up to a skylight, with doors on each floor radiating to individual display rooms. While there were a few odds and ends that were interesting, overall neither my wife nor I were all that entranced. So we wandered off into greater Glasgow to ogle the shops, the crowds they drew, and the occasional piece of art. And so began our Scottish experience, from dour castle ruins to artistic expression that put bees in the bonnet of the Glasgow City Council. Funny how a simple traffic cone can stir up so much civic pride and turn an everyday statue into a must-see tourist attraction. I hope the New Year is full of more of your great photos and entertaining descriptions. Hi Joe. Kind of makes you want to hang out with the Scots, and see what else they do for laughs. 🙂 Let’s hope for a good year of blogging all around. Hi CJ! It’s nice to be back. Hopefully, we can scrounge up a few more fun stories this year. Can you think of any other big shots you’d like to see with a funny hat? Are you saying this is commonplace, and all one has to do is say “Let’s see Charles II in a bowler hat” and boom, you’ve got it?! A most interesting and delightful post to kick off the New Year, Dave! Happy New Year! And here’s to many more. Happy New Year, Peter. Glad you’re back, Dave. I’m rather more sporadic myself than I used to be, so it’s good we’ve coincided. Happy New Year! Thanks, Mick. I’m hoping to be fairly regular for a while as I have a fair number of potential stories in the queue, but on the other hand I’ve noticed my posting rate is falling off since I started. It’ll be interesting to see how 2019 works out. Learned something new about Glasgow today. Welcome back, Dave. Thanks, Michael. That’s one of the good things about traveling, vicariously or otherwise; there’s always the chance to learn something new. I really like the first pic. It makes me think of documentaries I’ve watched about the ruins in Greece and how the Acropolis had color in it’s day. Then they would show computerized versions of what it may have looked like. Hope you had a happy holiday season! Happy New Year! I’ve seen similar documentaries showing CGI colors on the Egyptian monuments. 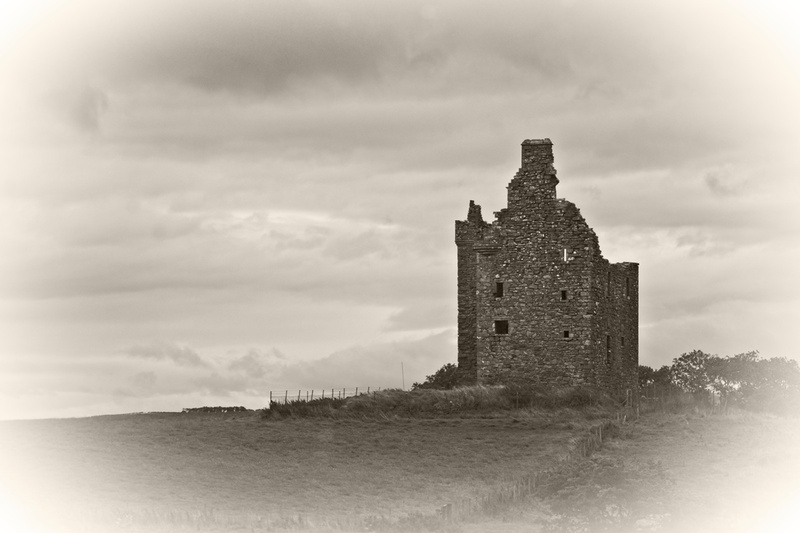 It make you wonder how the interiors of those old castles looked in their heyday, decorated. Some great shots — I really like the chandelier with the mosaic behind it, and the vertigo-inducing one, looking down the atrium, and the old-time-looking view of the castle ruins. Ha! I guess it’s karma that the Duke ended up with a shocking bad hat. I’d agree that the Scots still don’t have a great love for the English, especially of that and earlier eras. I suspect if the statue was William Wallace they’d make midnight raids to clean off the bird poop rather than put a silly hat on it. Enjoyed this visit to Glasgow, Dave, and especially the curious story of the Duke’s conehead. You are a good writer, and your story was a pleasure to read. Welcome back, glad you returned with more great stories to share. Thanks, Jet. Coming from a “real” writer, that’s much appreciated. Happy New Year Mr and Mrs Ply. Good to see you back. Glasgow had a rough industrial past so it is nice seeing the focus now on its cultural side. Lovely photos. I have a nice jacket as a souvenir of Glasgow. One to keep out the rain and cold! Look forward to your next item. Hi Gay. Happy New Year. Sounds like you had better luck shopping than me – I picked up a T-shirt in a kilt shop; I think they should stick to kilts. The shirt has shrunk on washing so much only Priscilla can wear it. I have to say I kind of like the cone too. Nothing wrong with injecting a little humor into our art and historical monuments, I think. (And if a painting of a can of soup can be art, then why not a traffic cone?) Welcome back to the blogging world, Dave, and I look forward to reading more about your trip to Scotland! Hi Ann, Happy New Year! There’s nothing wrong with injecting a little humor into almost anything, I think. Hopefully, I can find some for future Scotland stories. Welcome back, Dave. It’s good to take a nice long break every once in a while. I love the traffic cone crown. Much more creative than most modern art, of which I’m not a fan, either. I feel as though my intelligence is a little insulted when I look at it. Scotland is one of my favorite places. I never made i5 to Glasgow during my visits, so I enjoyed your account. Happy 2019! Hope the year brings you many new adventures. Happy New Year, Julie. Guess that’s the thing about the arts; different strokes for different folks. Let’s hope 2019 can bring us some enjoyable ones. Thanks, Curt. I actually shot that one with my cell phone, with an extra wide angle attachment. It does kinda draw you in, doesn’t it? I think everything improves when it has a sense of humor, assuming it’s not a mean spirited one. I have to disagree with you on modern art, and post-modern, or whatever. I may not like it all, but I love the challenges it often presents and I’m a huge fan of abstraction and minimalism. That being said, I like the skylight photo more than the Warhol one. 🙂 And maybe the “Keep the Cone” story goes to show that we need to keep reinventing life, through art or high-jinks. As an MFA, I wouldn’t expect anything less from you. I’ve generally found the “real” artists I’ve known see the world from the intuitive side of the fence first, and the sensory second. That might help with the abstractions; to feel something about a piece setting the stage before trying to make sense of it. I tend to swing from the sensory side first and the intuitive side second, probably a byproduct of spending all those years trying to make sense of computers. I don’t think either approach is right or wrong, just different strokes for different folks. Traffic cones are an integral part of British street art! On the head of statues, of drunken revellers, used to plow away snow (https://www.youtube.com/watch?v=MtfGaSrWpQk)… What would life in this archipelago be without them? I once saw one guy (trying) to play a Prodigy’s hit by blowing into a cone… the results were a bit on the lacking side but A for effort! I enjoyed your earlier posts on Ireland and I wish we could go there someday. Humour balances the heavier moments of travel. Not seeing much in our travels though. I wasn’t a fan of abstract or modern art. But there are some really cool artists out there and I’m learning to appreciate their art. Here’s to 2019 and new adventures! Thanks! I suppose it is good to take a mini-sabbatical now and then. The danger is not starting up again – blogs take work. Artists are an odd breed. I’m ok with saying that because A: a few of them really are off the charts strange, and B: it could be argued that I’m an artist too. I am glad to hear the Scots (at least some of them) have a sense of humor since my family name and some traceable ancestors are Sottish in origin. I have always wanted to go there. Thanks for the very interesting tour! Well, the Scotland series of blogs is just starting, so hopefully I can help you see a small part of it vicariously. Oh, that traffic cone made me laugh out loud! These are stunning pictures–thanks for sharing! And I know what you mean about modern art–I wrote a bit about my experience with that a couple of weeks ago:-) I just don’t get some of it! I suppose the nature of art is that it is a personal expression, and it’s impossible to relate to everybody’s personal experience. I mean, it’s not like everyone loves our blogs, right? Those two skylight / atrium pics are gorgeous. Also liked the marble staircase pic. I actually shot those with my cell phone, with a little wide angle attachment. I thought the whole interior of the city council building was impressive. Unfortunately, I had limited access there and missed some nice angles. Not sure why, but I find the Garden Lady creepy as heck!